How to Make a Delicious Sweet Truffle Oroe .Brown on this one is exceptional chocolate and Oreo Truffle luxury namely, why this could be called oreo chocolate truffle? The reason is as follows for chocolate this one has a spherical shape with a rounded size of a small lemon, but shaped like a mushroom truffles. So, this is known as sebuatan chocolate oreo chocolate truffle. 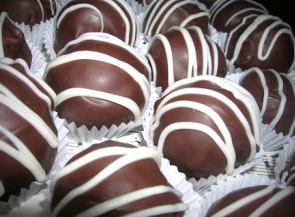 Oreo truffles can be if a variant of brown food unique and delicious, that by mixing the chocolate oreo biscuit and chocolate truffle puree and then cooled in a refrigerator. This chocolate dish will have a taste of chocolate is really good and tasty, tasty steady oreonya ,, because the chocolate flavor that fits perfectly on the tongue. If so let us follow how to make a dish of chocolate oreo truffles. Oreo biscuits dissolved or puree by means of a chopper or we also use a blender. Then we mix that has been crushed oreo was with cream cheese. After that we store the dough into the fridge for about 15 minutes or it could be that the dough is not hard to dipulung. Then we remove the dough from the refrigerator and then we shape the dough with a round shape, we round-round it off by hand, then we save it again into the refrigerator about - about 1 hours. Then we melt DCC with the way the team and enter the dots oreo earlier into DCC that has been thawed. Then we drain melted chocolate or attached to then put on a plate that has been paved with aluminum voil then we freeze. Furthermore, we had the oreo spheres decorated with a WCC that has thawed or in teams. And ready to be served. 0 Komentar Untuk "How to Make a Delicious Sweet Truffle Oroe "